Wisdom To Inspire The Soul: These 9 signs could mean you're over-stressed and don't know it. 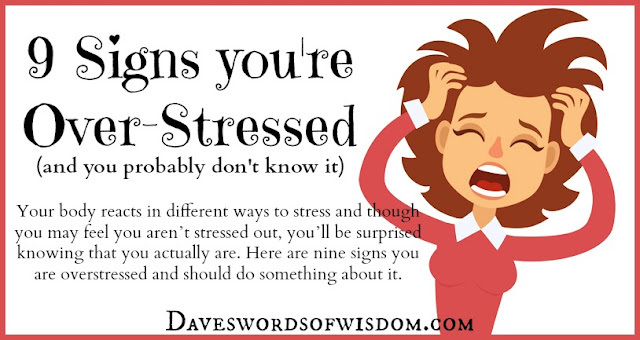 These 9 signs could mean you're over-stressed and don't know it. Stress can be a killer and even if it isn’t its one of the most miserable lifestyle conditions to suffer from. The problem with stress isn’t due to our physiology although there are some diseases that can cause stress. But more often than not it is external factors wearing out your emotions at work or even at home. According to the WebMD, stress is defined as a bodily response to environment change. Well perhaps but that should be more specific to read lifestyle change as what we undergo everyday as part of routine activity is what causes the stress. Our body reacts in different ways to stress and though many feel they aren’t stressed out, you’ll be surprised knowing that you are. Here are nine signs you are over stressed and should do something about it. When you’re stressed out, you may start experiencing unexplained aches and pains in your body. One clear indication of stress is stomach problems. Various other bodily symptoms are stomach ulcers, mouth ulcers, taut and tense muscle, chest pain and shortness of breath or palpitations. Arthritis may cause problems and headaches will be common. The first step towards stress management is acceptance. Insomnia and restless sleep is another stress related symptom. Both Insomnia and oversleeping are stress induced as oversleeping could mean you are exhausted. Such problems can be rectified with a healthy diet, exercise, yoga and meditation. However you need to locate the root cause of your problem where psychotherapy will help a lot. Restless sleep, nightmares, or incessant worrying at night all impede your state of mind which can also be reflected in the way you dream. Sleep is the first problem you face when stressed. Both sudden weight loss and weight gain could be an indication of stress which slows your metabolism resulting in gaining weight. Your emotional state affects appetite which in turns results in weight problems. Stress results poor circulation thus resulting in low levels of oxygen for cells. Your mental state directly impacts how you treat your physical body. eating disorders and the constant urge to eat is also a sign of stress. Inability to meet life’s challenges and manage work is one of the first problems to cause stress. Constant worrying can ultimately lead to increased psychological and physiological problems. If you are habituated in constantly checking emails, your phone, pouring over your work papers at night, the stress is taking a huge toll on you. The constant need to do something or the inability to sit still is also a sign you are over stressed. This also is an indication of high anxiety levels where the inability to relax or read a book inst there. Your mind could be your worst enemy in elevating your problems because of viewing them form narrow perspectives. You need to seek professional help in managing your emotional anxiety. In addition activities like sitting in a park, stretching exercises and spending some quiet time alone for introspection can help. Lack of tolerance and being impatient with others such as family members and friends is a definite sign of stress. If you find yourself snapping constantly at others and losing your temper, then it’s time to get help so that you ease the load of your shoulders. You simply have to slow down or you are liable to have a nervous breakdown. Like intolerance and impatience, moodiness is also due to stress. The typical behavior of laughing one moment and crying the next means your hormones are in turmoil. Stress makes you keep everything bottled up inside and when it does come out it releases a rush of emotions. Learn to talk to people. Confiding in friends or a close companion can certainly help. Stress not only drains you physically and emotionally, it takes a huge toll on your relationships. It can also trigger alcohol and drug addiction. Carolyn Jacob, MD, medical director of Dermatology says that most people shed 100 hairs a day. However when stressed out, that number reduces to a resting phase which is shed all at once three to four months later. In effect, stress upsets normal physiological cycles of your body and hair loss is one of them. This is one of the biggest problems of stress where males common experience a condition of erectile dysfunction and the inability to respond sexually to partners. The same could be said for females with stress. The lack of wanting intimacy of any kind is one of the biggest signs you are over stressed. Such problems definitely need medical attention and a proper stress management routine. Couples should always express their problems to one another because once the problems are out they no longer take hold of you.